Like most hikers and authors, I love doing presentations to groups. Heck, you spend almost six months thru-hiking, around the most diverse cast of characters imaginable, passing through almost every type of weather possible, feeling half-starved, dehydrated, scared to death (if you’re me! ), and bone-tired. And then if you decide to write about it–as I’m wont to do–you spend approximately the next year obsessing over the most colorful, but faithful, way to recount the journey. So when you get the opportunity to do a presentation, you snap up the chance. Heck, you should be ready after all that. Of course, there are presentations and there are presentations. Some are entertaining and informative, others not so much so. What is the difference? Obviously it depends on the presenter. The ones I have enjoyed (and hopefully emulated!) quite clearly enjoy being up there. They exhibit great enthusiasm for the journeys they are describing, as well as a deep respect for the audience. After all, every person out there has a virtually infinite number of other places they could be, or books they could be reading. Their just showing up is an act of deep faith. The presenter should not take that for granted. My personal opinion of a poor presenter is an overreliance on the use of photos. The idea is that the photos are of such quality that the audience will be swept up. Obviously, there is some merit to this philosophy. However, ultimately it is the narration that is the most important. Making the photos the centerpiece is usually a sign of an unimaginative narrator; what’s more these presenters often sound like they are reading the content. I have traditionally not used slide shows as part of my presentations. However, my recent book, Getting High–The Annapurna Circuit in Nepal, is a story of my 2012 trek through the Annapurna Range in the Himalayas. The scenery is of such majesty I feel a need to share it with the audience. Thus, at the Trail Days Festival in Damascus, Virginia this week I plan to use a slide show for the first time. However, I must permit this to make me become ‘lazy’. In other words, my presentation should not be along the lines of, “There’s the so-and-so. And here is a group of at the teahouse in …” No. The photos should simply be a supplement to the larger narrative I am relating. For each snap of the camera, I will do approximately three minutes of talking, and most of it will not even be about the particular photo. Hikers are a notoriously storytelling lots. There are some truly great storytellers in the hiking community, Baltimore Jack and Warren Doyle to name but a few. So when presenting at Trail Days there is an especial urge to be on my ‘A game’. I can’t wait! Bill Walker is the author of Getting High–the Annapurna Circuit in Nepal (2013). 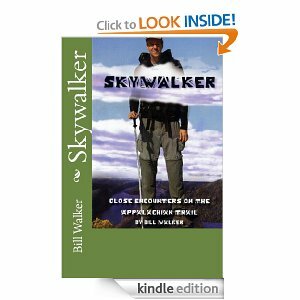 He is also the author of The Best Way–El Camino de Santiago, Skywalker–Close Encounters on the Appalachian Trail, and Skywalker–Highs and Lows on the Pacific Crest Trail. Walker, who is nearly 7-feet tall, is currently working on a whimsical book on the subject of height. Just finished your book on AT. FANTASTIC! Makes me start to wonder if I should wander. Daughter just got accepted to UGA. Coincidence? I think not! Thanks a million for that compliment. We writers live for such words. I would never try to talk somebody into attempting the AT. However I would tell the person who fervently desires to walk the AT, but is concerned that he (she) is not capable, to head on into the dark, deep wilderness. You would be in the same shoes I was in. Incidentally, if you see fit, a short review on Amazon (3 or 4 lines is plenty) would be greatly appreciated.